This story "School" is very short, it consists of only two pages. The plot is about the children who started to understand what the life is during the class at school. The first subject is death. Everything around them becomes dead (plants, animals, people). But the story is written in a very routine manner, from the first person. There are no explanations, just description of the sequence of events.
" ... where did they go? And I said, I don't know, I don't know. And they said, who knows? and I said, nobody knows." It is important to hear the rhythm of the narration, repetition of the phrase "I don't know", multiple usages of the word "and". The readers are able to hear the rhyme of the story "I said", "they said". "And they said, is death that which gives meaning to life? And I said, no, life is that which gives meaning to life. Then they said, but isn't death, considered such a fundamental datum, the means by which the taken-for-granted mundanity of the everyday may be transcended in the direction of--"
It is a deep conclusion, isn't it? Last part of the story turns to a request from the children to their teacher to show them what the love is. The last part of the story isn’t clear. Maybe the author wanted to change the tone of the story from depressing to an optimistic one. The last line gives to the readers a feeling of continuation of life because a new animal (gerbil) appears. 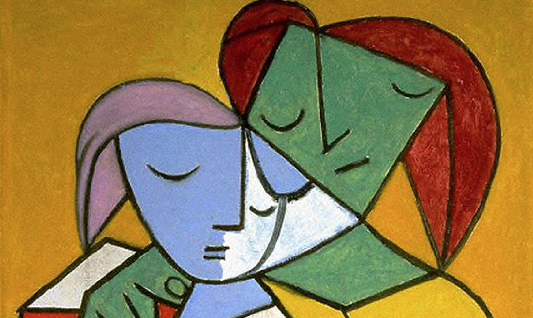 This painting looks very special, like Picasso's view of everyday life. The author's view of the school routine seems also different, it makes the reading truly interesting.